T Line Toilet Cubicle System is a hygienic, low on cost, high on aesthetics, fast flexible systems for toilets, restrooms. In order to cater diverse requirements of the clients, we offer an exceptional array of Public Toilets Partitions. Our entire product range is treasured for high quality and durable standards. Our entire product range is easy to maintain and are tear-resistant. We Provide best quality Product in good price according to client requirements. 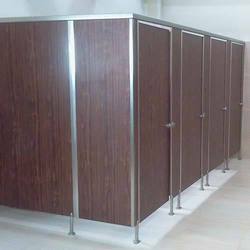 Design Space Stainless Steel Series Cubicles shall be equipped with the following accessories in Grades of (SS 202 & SS 304) as per choice of the customer. - Stainless Steel Privacy thumb turn. 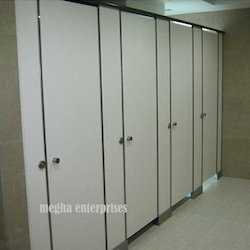 Radhika Enterprises carries a complete selection of bathroom and toilet partitions. We have several different configurations to choose. Our bathroom partitions are constructed from Solid uPVC Foam Profile firm materials with metal restroom partitions in stock. Our range of Toilet Partition cater to the requirements of full height doors as well as doors with over panels. We are also capable of manufacturing the product range as per the need and requirement of our clients. With the valuable help of skillful team of professionals, we are presenting Toilet Partition. We provide this product in varied sizes and design.